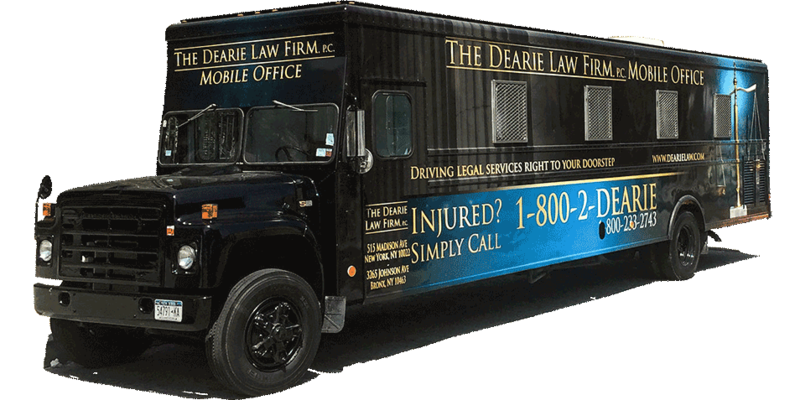 With three mobile law offices and four permanent offices in Manhattan, Bronx, Brooklyn. At The Dearie Law Firm, P.C., we specialize in Personal Injury, Slip and Falls, Motor Vehicle Accidents, Construction Site Accidents, Medical Malpractice, Asbestos Exposure, the 9/11 Zadroga Law, and most other legal fields. The Firm’s four offices, in Manhattan, Brooklyn and two in the Bronx, and three Mobile Law Offices, offers accessibility to our clients, wherever they may live. The Dearie Law Firm, P.C. was founded 30 years ago as the Law Office of John C. Dearie, and has grown since, with the understanding that our clients are the most important part of the Firm. We realize that when someone is injured, it can be a scary, confusing and overwhelming time. The Dearie Law Firm, P.C. has succeeded by every day working toward the goal of counseling clients through the complexities of their lawsuit, and attaining for them the highest settlement or judgment possible. Following the guiding principles of John C. Dearie, the attorneys and staff at The Dearie Law Firm, P.C. treat clients like family, which is one of the reasons so many former clients have referred friends and family who need legal representation. If you require legal counsel, or have any questions about your legal rights, Contact Us, or call us any time at 1-800-2-DEARIE (1-800-233-2743). Our three mobile law offices cover neighborhoods throughout New York City’s five boroughs. To find out where a mobile office will be in your neighborhood, or to request that a mobile office travels to your doorstep, please contact us. If you’ve suffered a personal injury from an accident and want to learn more about that specific-type accident watch below our Face to Face series. Just click on the type accident you’ve experienced.